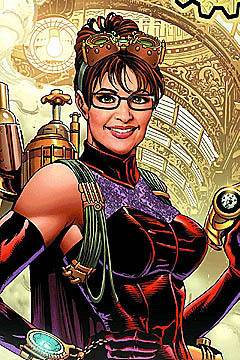 US comic-book publisher Antarctic Press have announced a new title – Steampunk Palin, where US Republican pin-up girl Sarah Palin stars as the – presumably ironic – champion of clean geothermally generated steampower, and has to take on corporate villains from the big oil mafia in her steampunk power armour. Can American politics and the steampunk genre co-exist happily? You can read about the new comic-book over here and make your own mind up. Seriously?? Wow. Um… yeah. I’m lost for words. LOL. I’m not a Democrat or Republican, but any airtime/face time that Palin gets really frightens the hell out of me. I know it won’t happen, but I wish she’d just go away.